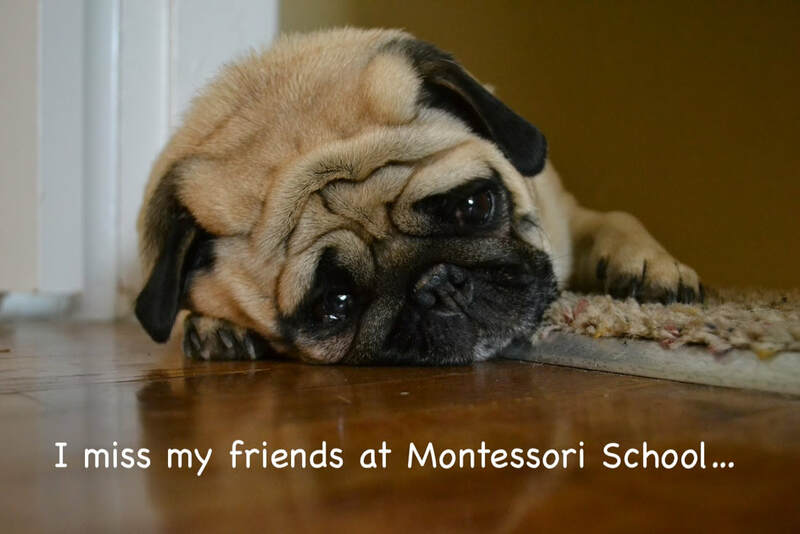 Lately, we have had a growing issue with absent students from our Montessori Dog School. While we totally understand that life can and does happen, we still need to address the issues. But before that, we want to express how much we appreciate all of our clients, and how wonderful it has been to work with all of you. To explain the issue we have to explain a bit about how things work on our end. You see, when your dog is absent, it doesn't just keep us from having another friend to play with. Because of our limited size we are often completely booked, leaving some dogs on a waitlist hoping to come play. Without proper notice we cannot notify our waitlisted folks, resulting in an empty room and a couple of sad pups. So we are asking you, MDS dog parents, please be a little more diligent with how we approach absent days here at Active K9. Below are a couple of refreshers on our policy, as well as some tips on how we can make this a better situation for everyone. Let Us Know if You Can't Make it: Can't get the pup to school? No worries, just let us know. Keep in mind, we no longer take schedule updates via text message or phone calls. We need all requests to be done via our Schedule Update Form. We can discuss possible changes, but it must be done via this form to be finalized. Simply save the link above in your favorite browser, and you will have it whenever you need it. Need it Done Faster? Because these are done through email, they aren't checked as rapidly as our office phone. If you have a change that needs to be taken care of in a faster manner, feel free to message the office line AFTER you have sent in your online request. That way we can get it taken care of right away. 24-hr notice: As you can see in our policy below, we have a 24-hr notice for our Montessori program. We have this in place to give us time to notify our waitlist, and see if we can fill that cancelation. If you haven't already, please familiarize yourself with the full policy below. Cancellation Policy: I understand that I will be charged a minimum cancellation fee of $25 if I fail to cancel a reservation at least forty eight (48) hours in advance. If I fail to cancel a reservation for a Sleepover, Sitting or Overnight program, I understand that I will be charged a no-show fee of up to (2) nights of said service in addition to the cancellation fee. If I fail to attend scheduled training or activity program it is Active K9’s sole discretion whether to reschedule missed activity or apply the cancellation fee. I understand that I will be charged credit off of my package or a $35 cancellation fee if I fail to cancel my Montessori Dog School reservation at least twenty four (24) hours in advance. Unannounced Absences: Unannounced absences can lead to disappointed students as more often than not we have a waitlist for school days. a. After 9:30am, any dogs not yet dropped off will be marked absent and may be charged either a package credit or a $35 fee. b. 3 infractions may result in expulsion from the Montessori Dog School program. Every July we hear horror stories about dogs that suffer through the 4th of July. While us humans enjoy the excitement of controlled explosions in the sky, our beloved pets tend to think WWIII has broken out, and that we have lost our minds for cheering about it. So do yourself and your dog a favor this year, and follow a couple of these guidelines to help ease their anxiety. A big mistake we see folks make is assuming their dog is okay with the loud noises of fireworks. While some dogs may be okay, it's really hard to know 100% one way or the other. If you are unlucky enough to find out the hard way, the last place you want to do it is outside. Since dogs have a knack for out running us bi-pedals, it's a sure bet that you won't catch them if they get spooked bad enough. This is why it's a good idea to keep your dog indoors for the later part of the day on the 4th and 24th of July. The best practice, and something we do at Active K9, is to take you dog for an extended adventure either the day before or the morning of the 4th. Reducing their energy levels will help them to keep calm easier, which can make all the difference when the finale goes off. We then make sure everyone gets a potty break shortly before dusk, allowing you to get settled inside just before the celebrations get started. Have you ever noticed how much scarier a horror movie is when you are home all alone? Well, dog can have a tendancy to think that way about this crazy world we live in. If you aren't sure what kind of personality your dog has it is a good idea not to leave them alone for these holidays. Your fur baby might not be nervous at all while you are there, because they feel safe around you. But being home alone is a different story all together. If you really are dead set on making out to your local fireworks show, do the responsible thing and look for a sitter ahead of time. While it might not be as calming without you there, your dog will still greatly appreciate not being alone. As I'm sure you are aware, what typically makes dogs so sensitive to fireworks is their exceptional hearing. A quick and easy fix to help you pooch relax is to give them something else to focus on. Just having the TV or radio on for background noise can go a long way in making your dog more comfortable. Some pups will definitely need more help than others in the keeping calm department. So much so that it can take more than a little white noise to keep them from worrying. Two great products that can really help are thundershirts or stress relief sprays. Thundershirts offer a consistent and gentle pressure to your dogs torso, mimicking the affects of being cuddled. This gives your pet a sense of security that drastically helps them cope with the anxieties around them. 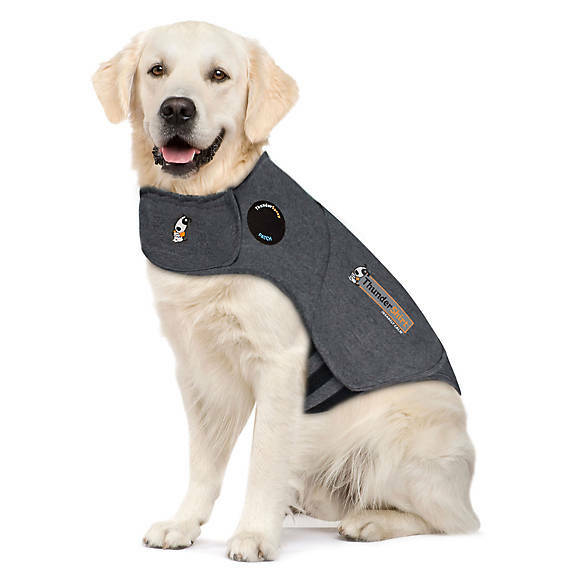 You can pick up a thundershirt at most pet stores, or directly from thundershirt.com. Stress relief sprays are another popular option to help calm down a worried pet. Using essential oils these sprays are non-harmful to your pets, and will help calm their nerves after just a few sprits. It is common to mist the front legs and chest, but can also be used on your dogs favorite bed to give them a safe place. At Active K9 we have personally used Nature's Embrace Stress Relief Spray, and can attest to it working quite well. You wear boots, so why doesn't your dog? When it comes to our furry friends an often overlooked area of care comes in form of their paws. While not as sensitive as our own feet, paws still need care to be in tip-top shape. Thankfully dogs have a natural sense of taking care of themselves. Unfortunately, there are certain conditions where it falls on us, the owner, to make sure we set them up for success. That is where dog boots come into play. The first part of paw care is knowing when and where its acceptable for your dog to run o'natural, and when they might need some protection. The basics are fairly simple, just think of the extremes. If it's too cold, or too hot out, their paws will feel it first. The walking surface can play a major factor on how severe these conditions are, so here are a couple examples of walking surfaces to be wary of. The winter months offer a different set of challenges. If you live anywhere that snows or freezes on a regular basis you are likely familiar with road salt. While sometimes necessary to clear out stubborn ice, this road salt can wreak havoc on your dog's paws. The chemicals used in most mass-produced salt can leave burns on your dog's feet, as well as make them sick if they are left licking their paws. Unfortunately, there is a double-edged sword here, because an icy surface can be just as dangerous. The biggest concerns with Ice is often frostbite, but slipping and falling can be just as dangerous. Some of us live in areas where rock gardens are quite prevalent. These can be great fun to explore with our pups, but there are things to worry about just as well. Rocks can have sharp edges, producing cuts if our dogs aren't careful. This is most common when dogs are running full speed, or climbing aggressively. The other side of the coin can be traction on slick rocks, such as river rocks or red rock in the desert. 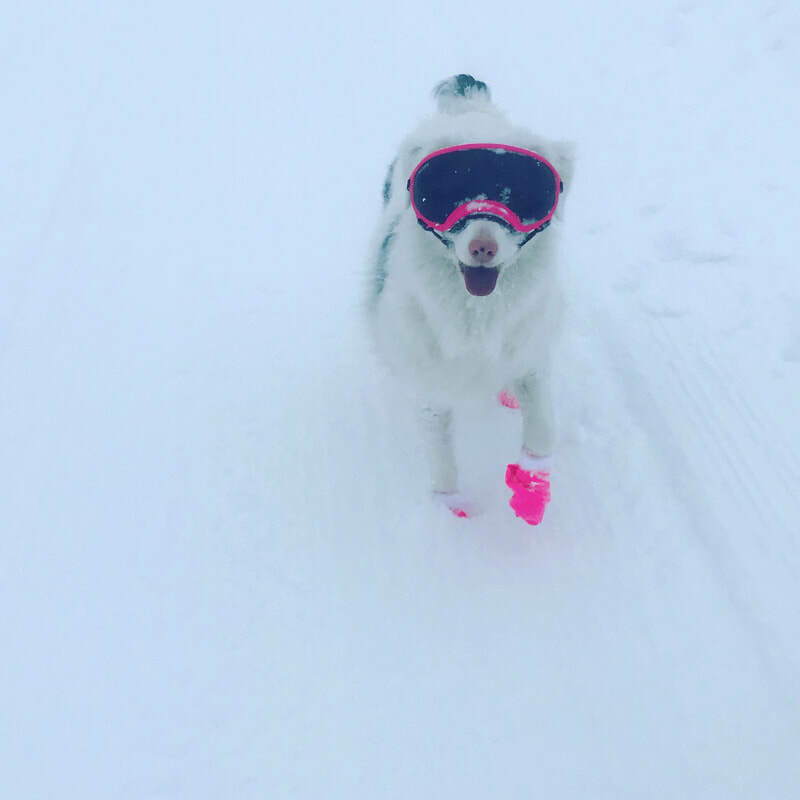 Thankfully we now have many dog-specific companies making boots to protect our fur-babies from these extreme conditions. There are basically two types of K9 boots on the market, rubber sole, and fabric based. 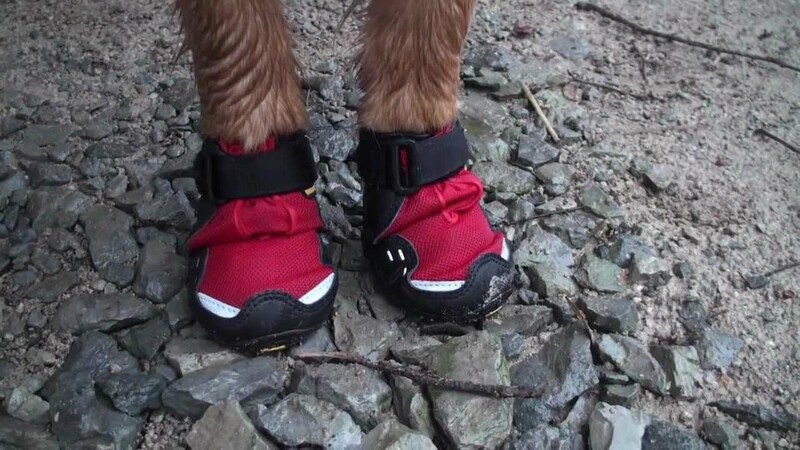 ​Rubber sole boots are likely the most common option when looking at dog boots. When it comes to outright protection these boots reign supreme, in both hot and cold conditions. They offer excellent abrasion resistance on hard surfaces, as well as giving much-needed traction on slick surfaces. The only area we don't recommend these types of boots is in deep snow where they can get kicked off and lost. At Active K9 we prefer the Ruffwear brand of boots, and have a pair for each of our pack. They are incredibly durable, lasting years thus far. The only drawback can be the fit, which can be a little challenging. Thankfully Ruffwear realized this, and offers a sock set that helps negate this issue. Not all dog feet are the same, so some dogs will need the socks, and some will not. 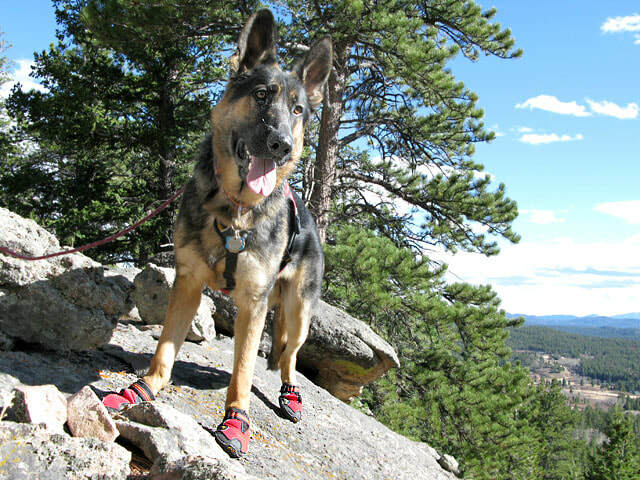 Fabric boots have a couple advantages over their rubber-soled alternatives, making them a great addition to your dog's adventure equipment. First is the fit. Rubber boots can run the risk of twisting into the wrong position; with fabric boots, there is no wrong position! Slip them on and you are good to go. They are also substantially cheaper, making them easier to replace if lost. In our opinion, this makes them the perfect deep snow boot on the market. But they are also adequate for other conditions, with the exception of heat and abrasion resistance. n., pl. lice (līs) for 1-3, lous*es for 4, n.
1. any of various small, flat, wingless insects of the order Anoplura. "Some education is sought after while other education is chosen for you." Nobody wants to see lice on their pet, any more than they do on their kids. Lice cause intense itching and scratching, and can make pets a bit crazy with all the crawling and biting. The good thing is that lice seldom causes long-lasting problems. Like human head lice, dog lice are usually transmitted in situations where dogs are gathered together. In this respect, lice infestations are a sign of a pampered pet!The dogs most likely to get lice are those who go to dog day care, puppy classes, agility, dog shows, or on group walks. The lice move straight from dog to dog by direct contact. There are two general groups of lice that infest dogs and cats - biting lice and sucking lice. They differ only in how they feed. All lice have powerful claws on all 6 legs, with which they cling to the hair shafts. They are able to hang on tightly enough that even vigorous scratching and biting will not dislodge them. Lice are slow movers compared to the speedy antics of fleas. They also do NOT jump. This is a great advantage for us. Unlike fleas, lice live out their entire life cycle on the animal. The adult female lice lay eggs, gluing them tightly to the hair shafts. The eggs are referred to as "nits". In the photo to the left you can see two nits from a dog seen at our clinic. The eggs are actually glued on to the hairs. One has hatched (the empty shell) and one is going to soon (the brown egg). Nymphs hatch from the eggs. These nymphs look the same as adults to the naked eye; they are just smaller versions. They molt several times and become adults. The entire process from egg to adult takes 2-4 weeks. 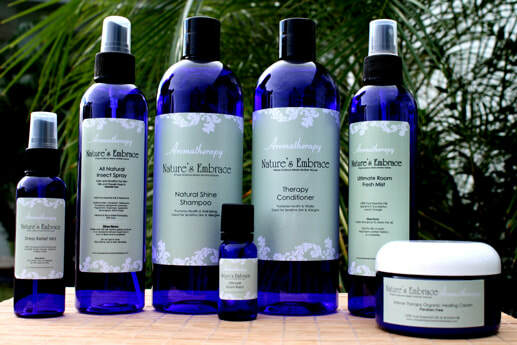 The biggest problem that the lice create is itching and its attendant loss of sleep and general misery. In severe infestations animals can become anemic due to blood loss; this is generally only seen in young puppies or kittens. Lice can carry tapeworms, so infested dogs should be treated for tapeworms once the lice are under control. They can also (fairly rarely) transmit other diseases. The first sign of lice that most people notice is the scratching. Suddenly the dog is intensely itchy. Upon close inspection, you might see some small, tan to medium brown colored critters down near the skin. You can tell lice from fleas by the color (fleas are quite dark) and the speed (lice are quite sluggish movers, while fleas usually zoom out of sight before you are really sure you saw anything). You might also notice the nits on the hairs. They are quite difficult to see with the naked eye. The empty shells look most like little bits of dandruff or dead skin. One way to tell is to use a flea comb to collect hair from the area you are suspicious of. If you can shake the hair and the 'flakes' fall off onto the countertop, it's just dandruff or debris. If the 'flakes' stick tight to the hair, they may be nits. There is no need to panic if your dog gets lice! Dog lice do not like to infest humans. Most lice are quite species-specific; that is, dog lice like dogs and people lice like people. It is definitely possible for a dog louse to get on a person, and it might even bite or try to feed, but it will not set up an infestation. If you see a louse from your dog on yourself, just pick it off or squish it (once you've finished screaming). Park City Animal Clinic's advice is to use a medicated shampoo that contains pyrethrin and a topical treatment such as Certifect. Wash all bedding and vacuum thoroughly. Powder Paws Vet Clinic's advice is similar with recommendations for the topical Activyl. Again washing bedding and vacuuming thoroughly. They also made the very good point of being aware that there may be an underlying condition that has weakened the immune system of the dog as healthy dogs generally don't get lice. Animal Health Solutions' advice is a bit more involved. Being our holistic vet their recommendations are for use of Neem shampoo (found at Whole Foods), instructed us to wash bedding with not only laundry soap but a hint of the shampoo as well and to add cut up pieces of flea & tick collar to our vacuum bag (this will kill anything you vacuum up, genius!). We were also instructed to add garlic and lemon juice to their diet for a time as Ph level and immune system could be likely culprits of why the dog was able to "catch" lice in the first place. As Active K9 is proud of our social programs there is always a possibility of dogs sharing more than just friendship. We encourage clients who frequent dog parks or visit other daycare/kennel facilities to either utilize a topical remedy or have a structured holistic system. My personal dogs for instance get an all natural dewormer (Diatomaceous Earth) in their daily supplements, regular baths and we use a neem spray when visiting the dog parks or camping. A good diet and a healthy routine are top priority as well. Rarely found on healthy dogs. Do NOT transfer from dog to dog easily. If you have any questions or concerns please do not hesitate to ask us or call and chat with one of our recommended vets. Carmie & Samantha have a combined 30+ years experience in raising, caring and loving dogs.